There is a variety of different housing available including Faunariums, Vivariums, Terrariums, Aquariums and Flexariums. A faunarium (pictured above; top left) is a small plastic terrarium, a terrarium (pictured above; centre) is an enclosure which can hold small animals in controlled conditions, a vivarium (pictured above; top right) is a wooden enclosure with front sliding doors, an aquarium (pictured above; bottom right) is a glass, top loading enclosure, and a flexarium (pictured above; bottom left) is a nylon mesh enclosure designed to provide optimal ventilation. It’s important to establish which enclosure would be best suited to the species in your care – for example, faunariums are best for temporary housing for the quarantining of juveniles but are not suitable as permanent housing as they are too small. Many new owners house their reptiles in unsuitably small enclosures under recommendation from pet stores or websites selling starter kits. The enclosure cannot be too large but can be too sparse, a 'busy' larger enclosure with lots of hiding opportunities and cover will do the animal a better service than a small enclosure. Some species may benefit from an outdoor enclosure during the warmer seasons such as with some species of tortoise and iguana. In order to find the most suitable type of housing for your reptile you will need to consider its natural behaviour, for example, is the reptile an arboreal species, terrestrial or aquatic. Arboreal species such as Chameleons and Crested Geckos will need more height than length to their enclosure as they will naturally want to climb. Terrestrial species such as Leopard Geckos and African Fat Tailed Geckos will require more floor space to their enclosure than height as they are ground dwellers. Aquatic or semi-aquatic species will require access to water within a water-tight environment. All reptiles will require enough space to move around and exercise appropriately. Vivariums seem to make the most suitable enclosures for most snake species. Precautions should be taken to prevent escape, one of the biggest precautions you can make is simply using a suitable enclosure for the species in your care. Snakes are particularly good at escaping - vivarium locks are available to firmly secure shut the doors of a vivarium. Tortoises are best kept in tortoise tables rather than vivariums providing better air circulation and humidity dispersal, this will provide better conditions for the tortoise. The ‘complexity’ of a habitat can affect stress in reptiles. 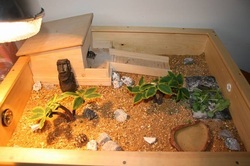 An enclosure which is too plain can leave a reptile under stimulated and feeling exposed which can be stressful, by incorporating decorative faux leaves and plants, suitable climbing apparatus, rocks, branches and plenty of hides this will be much more stimulating for the reptile and less stressful of an environment. Shyer lizard species such as Chameleons may remain hidden rather than expose themselves and therefore may not bask or eat in a sparse enclosure. This should be taken into consideration when setting up the enclosure. Do be sure to provide plenty of hides and coverage within a set-up, two or three is usually adequate for many species – a hide on the warm side of the enclosure, a hide on the cool side and a third moist hide which may also be placed on the warm end. Moist hides are particularly important when the reptile is due to shed. The two extremes to reptile housing are clinical and naturalistic. Often keepers use a combination of both styles when designing their set-up. Any environmental design should aim to encourage natural behaviour, allow the animal to maintain good health, and minimise stress and disease risk.